Aetna is a leading long term disability insurance company that Frankel & Newfield regularly encounters on behalf of claimants. We represent Aetna disability policyholders with long and short term disability claims. If your Aetna disability claim has been denied, or if your claim has been terminated, call Frankel & Newfield at 877-LTD-CLAIM to find out how we can help you. We can help protect your rights to your claim, and can fight Aetna on your behalf. Utilization of the same group of doctors who perform paper only peer reviews. None of these resources could possibly give a claimant a completely independent review of their medical records or claims. These tactics have been criticized by some Courts, who have noted that many of the doctors relied upon by Aetna have had their "bread buttered" many times by Aetna. Aetna is one of the country's largest insurance companies, providing disability insurance along with a wide range of other insurance products. Aetna insures a vast number of Americans in all 50 states, with products targeted to small, mid-sized and large multi-site national employers. Founded in 1852 in Hartford Connecticut, Aetna also owns a large number of subsidiary companies, from a hedge fund to a health information exchange technology company. In 2006, Aetna acquired the disability business of Broadspire, a large provider of disability insurance and casualty claim management services. The acquisition brought the number of Aetna disability insurance policy owners to 5 million long term and short term disability insurance policies. In other words, Aetna is a really big company with virtually unlimited access to resources to protect its own interests. Policy owners whose claims have been denied or delayed often feel overwhelmed by the sheer size of this major corporation. They come to us because they know that this is one battle they cannot win on their own. Often we are contacted by policy holders after they have tried and failed to appeal their disability insurance denial. A client suffering from Chronic Fatigue Syndrome and many other debilitating illnesses and spent more than 14 years fighting to keep working as a CFO for a large company. His claim was denied by Aetna, based on the results of one cognitive study. The attitude was that he had worked for so many years, he must be looking for an easy way out. Nothing could be further from the truth. We took an aggressive approach to his appeal. A high income financial executive was denied by Aetna. The long term disability insurance company claimed that he was not disabled because his medical care was irregular. He suffered from anxiety/depression and alcohol abuse, and as is often the case with mental/nervous claims, his care did not follow the typical pattern of care and treatment. He was seeing a number of providers, and we pieced together his treatment to demonstrate that he was maintaining continuity of care. He is now back on claim. Our Experienced Lawyers Will Pursue Your Aetna Disability Insurance Claim - Call Today! 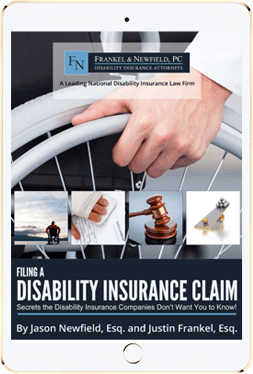 Frankel & Newfield has represented many clients in actions against Aetna long term disability insurance and we work with many Aetna disability policyholders who have had their claims denied, delayed and terminated. If you need help with an Aetna disability claim, call our office toll-free at 1-877-LTD-CLAIM (877-583-2524).